Are you looking for the last stepping stone to Mount Everest? We offer you an exciting opportunity to climb an 8,163 m (26,763 ft) peak Manaslu! It is located in Central-Western Nepal at 28°33'01''N/84°33'42''E. The route we suggest you embarking on was opened in 1956 by two members of a Japanese expedition - Toshio Imanishi and Gyalzen Norbu. They were the first to ascend the North-East face of the mountain which lies along the moderately angled slopes covered with crystal-white snow. Want to see the most magnificent views of the Himalayas? Book Manaslu expedition today! Manaslu is the eighth highest peak in the world. Its name means “the mountain of spirit” promising not only an unbelievable adventure but also an eye-opening experience. This trek is not an easy one – both physically and spiritually. We recommend it to skilled climbers who want to prepare for the mount Everest ascent. Make sure you have Cho Oyu and Shishapangma under your belt before you attempt Manaslu. The routes to its summit lie through the long ridges and wide glacier valleys. There are six ways to ascent Manaslu, and the South Face is by far the most challenging. Extreme altitude and avalanche potential make Manaslu climb a seriously risky expedition. However, Satori Adventures guides are trained and well-prepared for any kind of emergency that might occur in the mountains. In the event of a serious distress, illness, or injury, we can guarantee fast evacuation and assistance with getting qualified medical help. Also, we recommend all of our tourists to insure their health before they travel to Nepal and attempt Manaslu climb. Our guides provide extensive safety instructions to make sure you are aware of the risks and have all the necessary knowledge and tools to preserve your life and health in dangerous situations. We take your well-being very seriously! Our goal is to get you to the summit and back down safely. Manaslu climb is no picnic. However, Satori Adventures tries to make your expedition as close to a holiday as possible. Our Sherpa guides have years of experience leading groups and individual climbers to the summit. All of them are trained by European standards. We also provide porters with mules who can carry your personal belongings, climbing equipment, and other gear. Modern base camps and tea houses with convenient accommodations are sure to make you feel comfortable among the ice. We also provide professional chefs ready to cook delicious and nutritious meals according to your specific diet and preferences to ensure you have health and stamina for Manaslu expedition. Ready to reach for Manaslu peak? Don’t waste a minute! Click here to fill in the short trip inquiry form. We will get in touch with you soon after that. If you have any questions regarding Manaslu expedition cost or trekking details, don’t hesitate to contact us. Manaslu base camp is located on a rocky moraine with amazing views of the Himalaya. Satori Adventures base camp will be setup for almost 35 days. On an 8000m expedition climbers spend most of their time at base camp, so naturally on any long expedition, base camp becomes a home away from home. We establish our camp at a walking distance between meeting points with different group and strategic viewing positions of the Manaslu massif. Satori provides a personal tent which becomes your private retreat, a dining tent that is the common area, a shower tent and toilet tent. When you arrive at the base camp it will already be fully established and hot beverages and snacks will be available immediately. Waiting for you there will be your base camp staff and high altitude climbing Sherpa. Prior to your climbing period you will have a Puja ceremony at the base camp for good luck. This is one Nepalese tradition not to miss; it represents safe climbing passage for everyone involved in the expedition. Once you have reviewed basic and advanced training by your climbing Sherpa guide, you will be ready for your attempt to climb to camp 1 which is at a height of 18,700ft/5800m. In this section of the climb you will encounter mixed terrain including a few crevasses and short ice sections on the first section of glacier. Prior to the first section of glacier you will encounter grassy slopes, rock slabs and moraine. For average climbers it takes about 4 hours. The first section of climbing on the moraine takes about an hour, then you reach the crampon point at the mouth of the glacier, the glacier portion takes about 3 hours. Camp one is divided into two sections, lower camp 1 and upper camp 1, the distance between the two is 100m/328ft. The climbing from camp 1 to camp 2 is the most technical section on Mt. Manaslu. During this section you encounter the heart of the icefall. The first section is just slogging over snow for about an hour, and then you encounter several steep section of ice, 2 ladder crossings and steep snow climbing. Expect that this section will take you about 5 hours. Expect that you will encounter several steep sections of ice that are 100m at a slope of 65º. For most people this is the crux of the route. Camp 2 is situated above the icefall on a snowy terrace. Climbing from camp 3 to camp 4 feels like a long day, the distance of short nut now you are nearing the death zone. As all climbers as aware the oxygen levels are very low at this altitude so it is expected that any effort no matter how minimum or trivial will feel arduous. In this section you have to climb for 3-4 hours on steep snow that is on a 50-55º slope. This section is dangerous because the snow slope is covering a layer of ice which make ethos section avalanche prone. Comparing with other sections of the route, this portion is extremely physical with sustained steep snow sections at extreme altitude in avalanche terrain. Summit day, the main goal during the climbing period. Most climbers begin their summit bid at 1:00 am. if all goes well they reach the summit between 7-10 am. Below the main summit is a false summit, the main summit is reached via an exposed ridge. It takes about 4 hours to return to Camp 4 from the summit and another 2 hours to get to camp three for overnight stay. The climbing is not technical in the early part as you ascend through several basins with short snow headwalls. The climb passes the false summit and finishes on an exposed ridge to the true summit for a spectacular view of the mighty Himalaya. Satori Adventures Sherpa guides will fix ropes break trail and make every effort to assist the group to reach the summit of the 8th highest mountain in the world. 10 April/Day 01: Arrival in Kathmandu Airport and transfer to hotel Yak and Yeti or similar hotel accommodation in Kathmandu (1350M/4430ft). 11 April/Day 02: Preparation, briefings, last minute shopping and permit formalities. 18 April/Day 09: Trek from Namrung to Lho (3150m/10334ft) 5hrs. Tea house/camping. 22-08 May/Day 13-31: Climbing period. (8163m/26781ft.) Camping. 10 May/Day 33: Trek from Base Camp to Sama Gaun (3780m/12401ft) 3hrs. Tea house. 11 May/Day 34: Trek from Sama Gaun to Namrung(2550m/8366ft) 6hrs. Tea house/camping. 12 May/Day 35: Trek from Namrung to Philim village (2300m/7546ft-06hrs) Tea house/camping. 14 May/Day 37: Trek from Machakhola to Arughat (950m3117ft) 8hrs. Tea house/camping. 15 May/Day 38: Drive from Arughat to Kathmandu (1350/4429ft) 7 hrs. Transportation provided by tourist mini bus. Hotel accommodation in Kathmandu. 16 May/Day 39: Free day. Relax and shop in Kathmandu. Farewell celebration dinner with cultural program in the evening. 17 May/Day 40:Transfer to KTM airport for final departure. The cost of the trip always depends on the size of the group, category of the hotel accommodation and the facilities that you aspire in the mountain. We operate the peak climbing in full arrangement package and basic arrangement service (full board or base camp service) which directly affects the expedition cost. The itinerary may be changed after reaching an understanding between the agency and the client. Other activities could be added or reduced as per the client's request before processing the trip. Price for reduced activities could be deducted and additional activities could be added in mutual understanding. The number of climbing Sherpa guides, high altitude porters, kitchen crew, mode of transport you prefer and many other factors can affect the cost of the trip. Number of persons in group including; number of climbers, non-climber, base camp supporters, medical doctors, Alpine climbing guide also affect the cost. Either you want to operate this expedition as international group joining basics of Satori Adventures or individual (private arrangement) expedition. Climbing season: normally most of the climbers climb Himalayas in the spring and the autumn season. The climbing permit royalty cost for mountain will be 50% less in the autumn than spring season. Type of high camp food that clients require. Any specialized food that has to be ordered from foreign country will be costlier compared to the one available here. Either any of the climbers intend to attempt any world records? If so, do they require special services or equipment? Due to the above position the price range for the same trip can vary widely. So, we would like to discuss with our client before offering the cost. Please feel free to contact Satori Adventures for any information about in your selected package. Satori Adventures offers Full Board Service for our entire range of flagship Mountaineering Expeditions to all 8000m peaks. Our Full Board service means that we will provide a Trekking service, an in-Base camp service and High camp service executed by your Sherpa Climbing Guide. All our Full Board clients will have a personal Sherpa Climbing guide exclusively dedicated to the client for the duration of the climb. Our climbing Sherpa guide team will establish and secure climbing route in collaboration with other climbing teams participating on the route; Establish all high camps with camping equipment, provisions and oxygen and prepare high altitude food for his client; Assist his client on the route and ensure client safety and well being on the route through guiding and negotiating the route access priorities at pace and schedule determined by clients’ physical condition and preferred pace; Ensure total commitment to the client in case of emergency with clients’ safety and wellbeing as overriding priority. Assistance at KTM international airport by Satori Adventures during your arrival and departure. All Satori Adventures kitchen tent, storage tent, dining tent, client tents, toilet tents, tables, chairs and cooking utensils for base camp. Satori Adventures T-shirt and scarf. In the Base Camp: Satori Adventure provides very professional, supportive and friendly mountaineering logistic services. The approach from Kathmandu to the Sama Gaun village takes roughly 10 days. From Sama Gaun you climb up to Manaslu Base camp. Throughout your approach and climbing period Satori provides a high quality, supportive, safe, friendly, stress free and comprehensive service to maximize your summit opportunity. We provide a comprehensive service organizing all necessary permits, climbing documentation, travelling logistics (including airfares), ground transportation, porters, and other individual services required by mountaineers. On the trek to the ABC we organize all required accommodation and food. In the Base camp our cooks and helpers will prepare and serve three delicious freshly cooked meals a day. Satori also ensures that hot and cold drinks as well as healthy snacks are available 24hrs a day. In the Base Camp we provide spacious and durable 4 season personal tents for all of our clients. This comes with full board or base-camp services only. In the base camp we also provide a dining tent, kitchen tent, toilet facilities and portable shower facilities as well as tent accommodation for our staff. In the Base Camp we provide access to communication including a satellite telephone, internet access, and solar panels to charge your batteries. All arrival and departure transfer services to and from International airport with other necessary surface transport as per itinerary. Assistance at the KTM international airport by Satori Adventure during your arriving and departing flights. 4 Nights request category hotel accommodations in Kathmandu on B/B basis. Land transportation from Kathmandu-Arughat-Kathmandu for all clients, Sherpa guide, liaison officer and kitchen staff. All Satori Adventure kitchen tent, storage tent, dining tent, client tents, toilet tents, tables, chairsand cooking utensils at base camp. Common climbing equipment like rope, ice bars, ice screws, and snow bar. 3 meals a day: Breakfast, lunch and dinner with tea and coffee. All food and fuel for base camp during climbing period. 50kg baggage allowance per person during trekking period. will be carried by porter/mules. Services of chef and kitchen assistant at advancedbase camp. Manaslu restricted area trekking permit during the period of expedition. All wages, equipment, medical and accident insurance for all involved staff during the trekking and climbing period. Medical consultation services at the base camp with the HRA clinic at the base camp. Equipment allowances and wages for chefs, kitchen assistants and government liaison officer. Satellite phone carried by the guide for communication available upon request for clients with the cost of $3USD per minute. Emergency oxygen mask and regulator provided for clients if needed. Appropriate charge will apply. Each expedition member will have an individual tent available in the Manaslu advanced base camp. We provide Sherpa's tents, food for climbing, and insurance. Any packed food/snacks, aerated drinks, energy drinks, mineral water, alcohol, cigarettes, chocolates, nutra-bars. Expenses incurred from usage of landlines, mobile devices, walkie-talkies, satellite phones and Internet. Any additional staff other than the specified. Satori services will not be involved in any capacity above advancedbase camp. This means we do not allow any staff or equipment from Satori Adventure above ABC. High altitude food for Sherpa and clients. The trekking to the Manaslu base camp is absolutely breathtaking and takes you back in time when all Himalayan mountains were approached on foot. The trek starts at a low elevation of 800m in Arughta and rises gradually over the next 9-10 trekking days. It is a perfect way to acclimatize before base camp is reached and to take on climbing relatively quickly. From the village of Arughat situated in the low country the trek climbs through narrow gorges, rhododendron forest and local pastures to emerge into the higher alpine country with Tibetan influences. The Advanced Base Camp 4700m is located at the lateral moraine of the Manaslu Glacier and it can be reached within a 9-10 day trek. Along the trekking you will have a great experience of nepalese culture and pristine native flora and fauna. During the trekking to Sama Gaun we provide camping accommodation, we can also adjust depending on group size and departure dates and provide tea house accommodations. The accommodation and meals are basic and limited compared to Everest or Annapurna trekking. The Manaslu approach is much more wild and primitive. 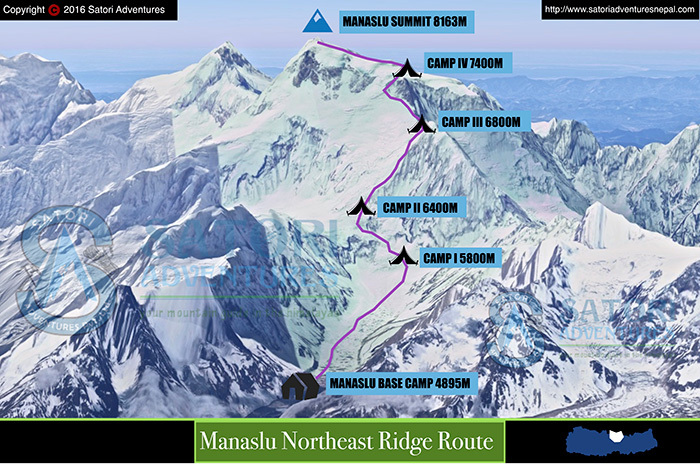 Manaslu has many interesting routes leading to the main summit and many of them were climbed and explored. The standard commercial route is along the original route of the 1956 Japanese expedition up the Northeast face. The climb is straightforward and only slightly more technical then Cho Oyu or Shishapangma, however with a low base camp it is a long climb and with relatively high objective avalanche risk. Traditionally there are 3 camps above base camp: C1 (5,500m), C2 (6,300m) and C3 (7,300m). Some expeditions establish an intermediate camp between C2 and C3 at 6,700m. The terrain encountered on the ascents varies from glacier crossings to steep snow steps and requires a good understanding of basic alpine climbing techniques. Manaslu has been climbed Alpine style but traditionally all commercial operators practice expedition style to improve the chances of summit success for the clients. How do Sherpa guides work at high altitude? When you arrive at base camp, our staff will set up the camp and you will have time to rest and prepare for a proper acclimatization period. Upon completing a Pooja ceremony at base camp, the climbing Sherpa guide will open the route and set up camp 1. Once the camp is set up, clients will be taken to camp 1 to acclimate. Depending on your physical fitness and bodies’ reaction to altitude, you may stay at camp 1 for another night, or move up to camp 2 and then descend back to base camp. Next our high altitude Sherpa guide will open the route and fix lines to camp two, ferry gear, equipment and food to camp 2. We will then provide a similar acclimatization to camp 2 that we did on camp 1. If required and the weather conditions allow, they will allow you to sleep one more night at camp 2 and then return back to base camp via camp one. During your rest and time at base camp our Sherpa guide will open the route, fix the camp, supply food, oxygen, and equipment and prepare for the summit push. After your camp one and two acclimatization, our climbing Sherpa guide will check the weather forecast, group fitness and recovery conditions. If upcoming weather reports, your physical fitness and Sherpa guide conditions are good, we will begin the summit push. On the summit push, you will move to camp 1, camp 2 and then camp 3 before moving to the summit. At camp 3 you will awake at 01:00zulu and begin the summit push. If for any reason (bad weather, group physical fitness, accident, incident) we have to return to base camp before the summit push, but still we have a climbing duration, weather condition and climbers are interested for re-try we will provide one more opportunity. However, more than 98% of people either have a successful summit bid or give up the first try. It is important for each climber to choose the right expedition guide service that not only suites their needs, but provides the best safely and secure mountaineering experience possible. There are more than 1,700 trekking companies in Nepal who offer 8,000 meter expeditions including Everest, but only about 30 companies who operate 8,000 meter peaks on a regular basis. We are proud to be one of these 30 companies and consistently offer, run and succeed at these types of expeditions year after year. We are always developing and growing our operational systems to ensure you participate will provide as much as facilities provided. We figure our expedition members do not deserve anything less during the trekking and climbing! In the interests of giving you the most optimal chance to summit, we limit our team size to ensure the group summits on the best weather day; sometimes there are less window days for summit in Everest. In big size of group offering cheap climbs often miss out as they split their groups over several potential summit days. We feel like our climbing members are feeling that they are climbing as a family and friends team even on international people. We accept maximum 08 people in a group and if we have more than that we always split in two groups. So that our base camp staff cooks, climbing Sherpa guide will fully taking care about you and provide service as per your desire. The Satori Adventures methodology and tactical approach to climbing Mt Everest has seen us achieve the highest success rates and our extensive experience gives us the edge when it comes to making the right decisions. We provide a consistently higher Sherpa and Guide ratio than any other operator, resulting in more support and backup for your summit attempt and therefore a greater safety margin and chance of success. There is always a 1:1 ratio of the climbing Sherpa/guide and client. We always use professional and experienced climbing Sherpa or guides who have all reached the summit of Everest. Our guides are professionals who are trained and assessed either via the International Federation of Mountain Guides Associations (IFMGA) resulting in a greater repertoire of skills that enables them to provide a dedicated level of security to you during the expedition, or many years of mountaineering experience on the world’s biggest peaks. Our guides are experience in both advanced and basic rescue courses and all have a minimum of 3 years guiding on Everest. Satori Adventures Everest expeditions have been at the forefront of providing top communications for our Everest expeditions.This allows us to obtain and deliver comprehensive weather forecasts via U.S., European and Kathmandu weather forecasting. Our lead guide is always equipped with a satellite phone during the climbing and at base camp. Two way radio communications between climbing members, guides, Sherpa and base camp staff is also provided. There is also local mobile network available at base camp that provides easy connection with your family during your stay at base camp. To ensure the safeties of our climbers, we always try to use professional weather forecast services. We receive constant updates during our summit push, camp one, two and three acclimatization periods. Exact and updated weather reports are a major factor for a successful summit opportunity. Mountaineering expeditions are a serious undertaking and climbers need to be aware that there are certain risks that are out of the control of Satori Adventures. We prefer to describe our Manaslu expedition as professionally managed rather than guided. Our expedition leaders always have a satellite phone for communication. We always pass the upcoming weather forecast by phone call and text. However now a days there is a local CDMA phone connection at Manaslu Base camp and around Sama Gaun village. We provide a portable altitude chambers (Gamow Box), medical oxygen, and high altitude related medical equipment at base camp and the high camps. We also supply a stretcher above base camp in case of serious injury and the higher camps will also have medical kits. We also ask all climbers to carry individual micro high altitude medical kits above base camp. All climbing members and climbing Sherpa guide are required to wear a personal avalanche beacon above base camp. Finally, we always request all of our climbers to make sure that they have medical and travel insurance which will cover a helicopter evacuation in case of serious sickness or injury on the mountain.